On the opening night of DokuFest, Kosovo’s most famous documentary and short film festival, supported by Limak Prishtina International Airport “Adem Jashari” and based on the creative idea of a Kosovar communication and marketing agency Paper Communications, ramps were installed at each end of one of Kosovo’s oldest bridges and visas were required and issued to all the international visitors cross the bridge. The old stone bridge meant to connect the two sides of the city of Prizren, was turned into an improvised border where actors dressed as police officers requested all internationals to fill out an application form, have it reviewed and be issued a passport like flyer containing a ‘visa’ for them to be able to cross the bridge. The organizers and creators of the performance art installation stated that “being one of the countries with the youngest population in Europe, and being located in one of the most dynamic parts of Europe, we wanted to create this installation to display the preposterous treatment of Kosovar's when it comes to the freedom of movement. In a world that embraces and promotes globalization, we would like to invite everyone to experience the mockery that is the 'visa application process' which all Kosovars are subject to”. The visa application forms, filled by each international wanting to pass the bridge, consisted of ridiculous questions, such as ‘Are you afraid of spiders?’ and ‘Do you think we are alone in the universe?’ while visa’s were sometimes granted for a ridiculously small amount of time with only thirty seconds of stay allowed. One of the most important issues that plagues Kosovars is that of free movement. Kosovars have only a handful of countries they can travel to without requiring a visa. 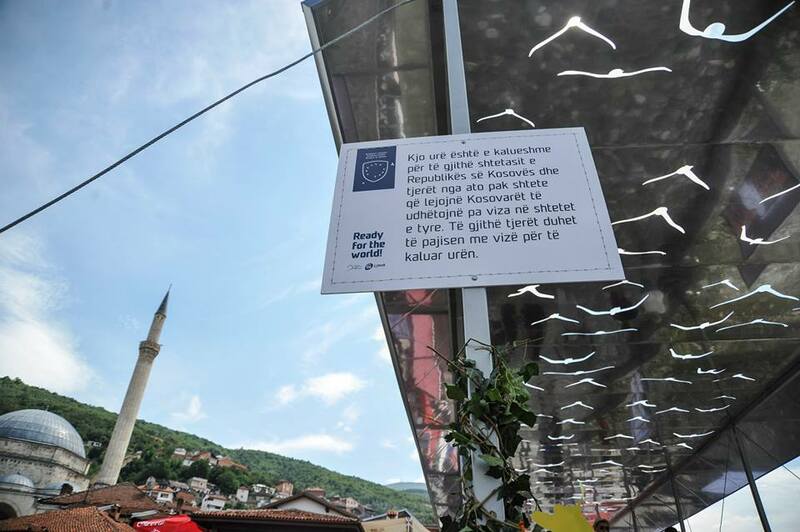 With the finalization of the EU liberalization process for all the countries from the Western Balkans, Kosovo continues to be the only country in the region that is still required visas to enter EU.